Can we just skip right on past the fact that I haven't blogged in over a month and move straight into one of the main reasons for why that is so? Pretty please?? It's Spring time here, or it's suppose to be anyway. So far it's been one of the wackiest Springs that I can remember. The weather has been an extension of Winter with the odd sunny day in there just to tease us all. I'm talking cold, wet and wild with more record rainfalls! Last week I got another load of firewood delivered which makes two extra tonnes on last year's season. All of us around these parts have erh well, to be blunt, we've all had a gut full! Over it, enough, done! Bring on warmth and sunshine. Parts of Victoria had snow yesterday... SNOW! In October!?!! That's crazy. And we had an overnight frost which I am hoping against all else wasn't so extreme that it damaged all my new plantings. Which brings me to the garden. It's all happening out there now with seeds sown and beginning to germinate and some little seedlings growing inside our craft room - which is north facing and full of glass windows so it's perfect for doubling as a glass house and getting those babies off to a good start. I couldn't help it on the Wisteria photos... their flowering days are so so brief and this year has been a particularly beautiful year for them, and all blooms really. Apparently that is because of the crazy of amount of rain we've had, which makes sense, doesn't it? Anyway, already the petals have mostly dropped and the new leaves are unfurling so I'm glad I took those pics when I did. So let's talk about what's growing, what's been sown and what will soon be transplanted, planted or sown. The snowpeas have now gone from their seedling trays to being in the ground. There's an entrance point on the opposite side to where I took that pic above and the idea is for it to create a teepee as it grows. That will be Noah's hut with Evie's pictured below. She wanted hers to be without food growing on it, so using a bunch of branches we have been saving especially, the making has begun and with a bit more scrap fabric to weave through, it'll be fit for a garden Sprite, Elf, Queen, Princess, Fairy... or whomever else she chooses to be. I've also built a very basic firepit for these outdoor months to come. It's nothing fancy but it will do the job! There was already a mound right where it is that was the earth and gravel left over from transplanting the mulberry (growing happily behind it next to Evie's hut), so it wasn't hard to scrape it, shape it and pack it around some bricks (of which we have plenty on hand). Then tadaaa... a firepit ready for the outdoor evenings to come. That there is a close-up of our mulberry tree and I'm not quite sure what to make of it...? Our Winter to Spring transition has been out of the ordinary to say the least and I think it may have knocked this one around a bit. In previous years it is usually the time for mulberry harvest right now but these are not ready for picking and I'm not entirely sure that that fruit is looking very happy. I have noted some of the other Mulberry trees in the area and their fruit looks to be a little behind as well so given the leaves on mine look glossy and healthy and the rest of the tree is thriving, I don't think it was the transplant that's done it. In fact I think it's going to love this new spot and perhaps with the nature of our odd Spring on top of the move it might just take until next year before we harvest anything edible...? In the mean time... looky, looky, looky... the fruit set! Do you see those wee little green beauties up there? They are itty bitty baby cherries. I put two dwarf cherry trees in a half wine barrel each, about two years ago. Or a little longer I guess given they were bare rooted and planted in the depths of Winter. They are both Stellas which are meant to be perfect for eating fresh (as against cooking with or preserving) and have a firm skin with a slight crunch to them. Just the way I like them! I'll let you know how they rate once they are ready. This is our first year for these and I guess we must have had enough chill hours for the fruit to do it's thing. We three are SO excited and we each keep checking them daily, possibly even several times a day, but shh who's counting ha. I'm going to have to net them soon I think - sorry birdies, I'm not willing to share when it comes to cherries. Finally!!! The beginnings of some natives, yippy yay yay. I purchased these two plants late last Spring... no kidding! They sat there waiting for me to get them into the ground but then life happened and the Summer heat took hold and one thing led to another and I just didn't get there. Thank heavens natives are tough because these two babies really did not get the attention they deserved. Despite that, they are now both happily planted out into that strip next to the trampoline and as soon as I save up a few more pennies there will be other natives going in around them. Woot woot!!! More looky lookies... we have some banana passion fruits ready for harvest. That vine has it all going on, there's flowers opening up for pollination, there are little green fruits, big green fruits and yellow ripe fruits. This is our first year of harvest for this vine and I can't tell you how excited I am about that. I grew this baby all the way from a little seed! Isn't that just THE most satisfying, miraculous, rewarding and joyful thing of all. Those are some mystery leaves. I mixed a few seed packets together... some herbs, Asian greens and lettuces so I'm not entirely sure what these ones are but, all the same, I'm happy to see them poke their little leaves through. HELLLLP!!! They're at it again! Urgh!!!! Those little devils are the bane of my gardening existence. Oh what to do, what to do?!! Perhaps I should barricade that one strawberry plant and make it the sacrificial plant to the destructive force that is the slater beetle. Do you think it would work? You know, allow them the feast of that one plant while using a barrier around it to keep them away from the rest of the patch? None of the others have much developing fruit as yet so I don't know if there are other plants affected but gee, can I just have a few homegrown strawbs, please??? I've companion planted some borage and pyrethrum in among the plants but with all that wacky weather they are slow to get going and I'm not sure how effective they are against slaters...? 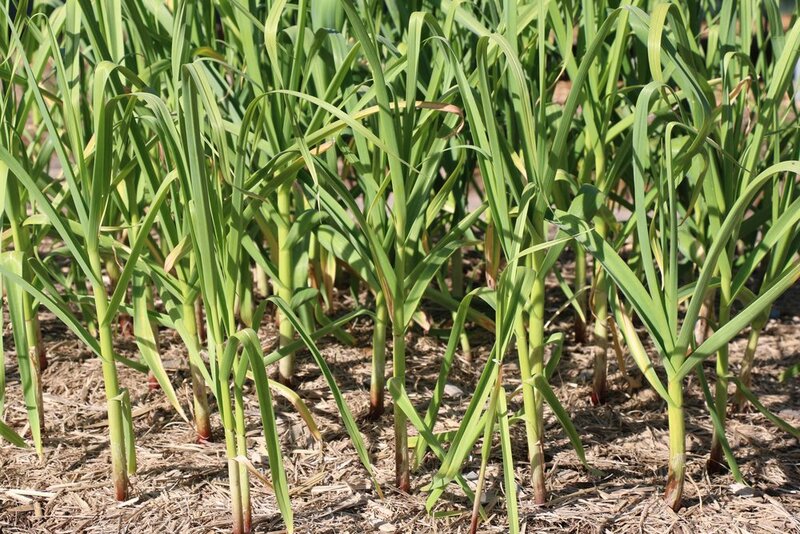 Garlics, oh the garlics. I was a bit worried about them towards the end of Winter as I thought we might have had too much rain and maybe not enough frost but the last couple of months have fixed that. Yes there has still been the rain (sooo much rain!) but we have definitely had a good dose of frost too and over the last month or so those stems have really fattened up (which to me indicates a bigger bulb and more garlic per clove.. yum, plus a much easier job with peeling). The tops are just starting to die off a bit so I think we are on schedule for a mid-November harvest. In the past I have loved timing my garlic harvest with Beltaine, it always feels so perfect to do it on Halloween, but not this year. The 31st of October is only one week away and I'd like to see those tops brown up just a little bit more before I pull them all out. We'll see, there are some very beautiful warm Spring days forecast in between now and then so you never know what next Monday may bring... perhaps a Beltaine harvest after all? Ah the crab apple. We're so close, so very close. When that tree bursts into full bloom that is when I officially know we are into the warmer months and our nightly fires become fewer and farther between. Not to mention the fragrance and the sheer spectacular sight of all those pink flowers. Oh I long for it every year, in fact, I think most of the neighbourhood does as it is a bit of a show stopper. Each year it becomes the local talking point that tree and already there have been a couple of comments over the fence... "look at that, looks like it's nearly there". Yep, yep it sure does! 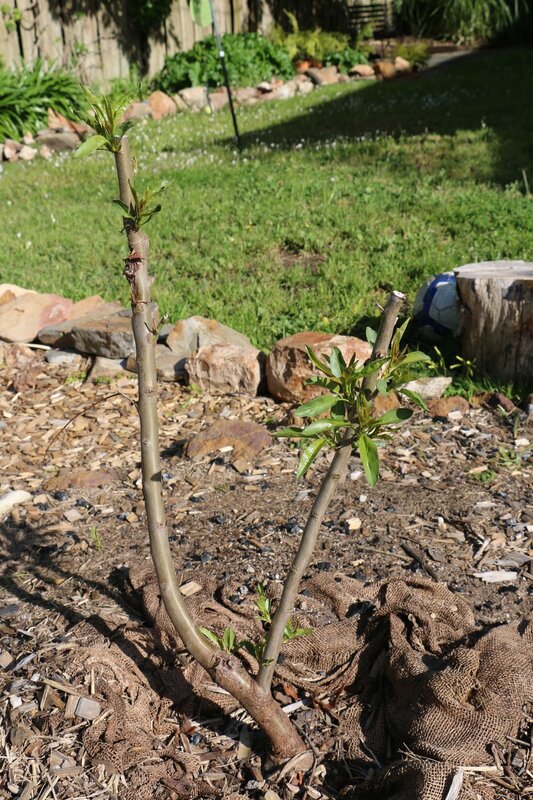 I gave our bay tree a pretty heavy prune early in the Winter and now it is shooting out with new growth all over the place. Having fresh bay leaves on hand... I tell you, never again will I be without a bay tree. I do however, really need to dig it up next Winter and transplant it into a barrel or something. I have a better spot for it than where it is and I want to keep it to a smaller more manageable size. And at last our newest babies. I picked these up just yesterday. The top one is a Japanese mandarin, easy to peel and sweet as sweet when left to fully ripen, or you can pick them a little earlier if you're like me and prefer some tartness to your manda. The bottom one is a pomegranate which are tough and tend to thrive in our temperate climate. A pomegranate isn't on the garden plans and I didn't even know I wanted one until I found myself looking at them yesterday at the nursery. I actually went there to get myself some Blueberry plants for our three empty pots by the veranda steps but as it turned out, they were out of stock and will call me when they have more. Well I'd driven all that way, I couldn't possibly head home empty-handed could I? Nope, I didn't think so either! And just on the side, things are changing a little from those garden plans. Nothing significant but small refinements as things take shape and evolve, just like Nadja said they would. I love this process! So there we have it - an update on all the Spring-time garden action. It's busy out there these days and underneath all that mulch you see below are lots and lots of seeds getting ready to burst forth. I'll be sure to keep you posted on their growth and all the yummy bounty. Tomorrow promises 27 degrees (Celcius) with warm sunshine and I have plans to be sowing another round of tomatoes, corn, cucumbers and whatever else I get inspired by in the moment.